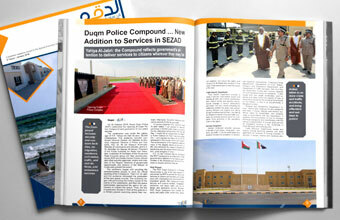 The Special Economic Zone Authority in Duqm (SEZAD) issued the new issue of Duqm Economist with the theme of celebrating corporate social responsibility (CSR) in SEZD. In his editorial, Yahya bin Said al Jabri, Chairman of the SEZAD Board of Directors, indicated that SEZAD focuses on CSR with its three dimensions, namely human, environment, and legislation. “This emanates from SEZAD main objectives for the development of Al Wusta Governorate, advancing lifestyle and livelihood in Duqm and providing employment opportunities for the citizens. Youth education, training and qualification programmes have attracted the attention of SEZAD and the various companies operating in SEZD,” added al Jabri. “During the past four years, SEZAD has been spreading CSR culture among the companies operating in SEZD and promoting this concept to live up to the aspirations of the people of the Wilayat of Duqm in particular and Al Wusta Governorate in general,” stated SEZAD Chairman. Duqm Economist, edited by Mohammed bin Ahmed al Shezawi, has highlighted the attention accorded to the local community by SEZAD and the companies operating in SEZD. The implementation of 130 CSR programmes since 2011, notably provision of 29 grants for graduates of general diploma certificate from the people of the Wilayat of Duqm for undergraduate study in private universities and colleges in the Sultanate is a testimony to that attention. The new issue is diverse and rich with many topics and articles. The projects sector focuses on tenders awarded by SEZAD during the past year at a cost of RO 176 million. In the field of investments, Saleh bin Homoud al Hassani, Manager of the one-stop shop, stated that SEZD attracted investments estimated RO 242,300,000 last year. Moreover, the issue touched upon the efforts of the operating companies in SEZD. In this regard, Stephen Thomas, CEO of Renaissance Services Group, affirmed his confidence in the promising future of Duqm. He stressed that the company’s investment in SEZD, amounting to $200 million based on realistic grounds, pointing out that Renaissance Village in Duqm aims at providing high quality services to its residents. On his part, Shaikh Ibrahim bin Sultan al Hosni, CEO of Duqm Development Company, noted that the implementation of the second phase of Duqm Façade City would commence by the end of this year or in the first quarter of next year. In the articles section, Abdulaziz al Hinai, wrote about CSR while the columnist Musbah Qutb emphasised the need to pay attention to education and training programmes within CSR. Dr Ayman el Nahrawy, Professor of Transportation, International Trade and Logistics, touched upon the logistical performance and its role in seaport competitiveness while the editor-in-chief devoted his column to a number of projects taking place in Duqm, considering them key milestones for the future.